You are currently browsing the tag archive for the ‘portrait art’ tag. Ive recently been finding out about an interesting Americal artist who uses them to help him paint on the canvas. And yes, they are … ALIVE!!!! Kutcher controls the direction and movement of his arthropods — such as hissing cockroaches darkling beetles and grasshoppers — by their response to external lighting. The result is controlled and random movements, created in a co-authorship between the artist — with predetermined ideas about colour, form, shape and creative flexibility — and his living brushes!?! see here for some more details! Here are some more paintings that we did recently. See www.portraitxpress.com and go to the gallery dection, to see further examples. We hope to keep regularly putting up examples of our Portrait Artist’s work, so you can get an idea about the quality and good standard of the work, and transpanency of the business. Here is the painting, on Canvas. As we use the word Xpress- yes, this means we are VERY fast! But also the quality is top notch. The subject/ client can review the painting and request any changes they want to it also, and choose the size, style, make alterations, etc. Hollywood Icon James Dean art- get your ‘face’ on a James Jean poster!! Well, just to show people what art we can do at portrait xpress, here are the steps involved in a painting we did recently. First we were contacted by a customer, who’s boyfriend loves James Dean. They wanted us to paint (by hand, no printing) a James Dean style poster, like that below- but instead of using James Dean’s face, they wanted the boyfriend’s face!! Of course we love James Dean and were very enthusiastic about this fun project! We can’t show you the client’s photo, but here is the final painting below by one of our great artsist!!!! Amazing eh. What a great gift! We have cropped the picture, so you don’t see the person’s name as thats private…. so actually the painting was the same shape as the original poster. The subject wasn’t posing with this picture in mind, otherwise the result could have been even better- if they had tried to do a similar pose as James Dean!! Hope this stimulates people’s imagination! and here a a few James Dean photos for you out there…..
What? you don’t know who he was? actor, photographer, race driver, artist, ultimate rebel and one of the greatest Legends of the 20th Century. more OBAMA IN (VIRAL) ART! for those who liked my Obama in Portrait art post which showed some Obama artwork, and I was trying to encourage people to get themselves painted in a pop art style by the cool painters at portrait Xpress, here is something more for you!! In fact, there is a whole Flikr group dedicated to “obama street art”!! An entire blog has sprung up entitled The Obama Art Report!! The recent months have seen a street movement in support of Obama, which the presidential candidate’s campaign itself has embraced!! 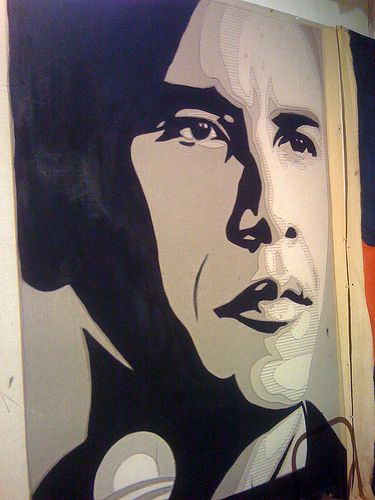 Obama for Artists (the store on the obama website) features art and merchandise donated to the campaign by artists to raise money for the movement. Its incredible to have a presidential Candidate who has inspired such an outpouring of creativity, the effect on voters is yet to be seen I guess…. what does every good dog want for christmas? okay, Im sure its food. Preferably stinky unhealthy food which will then make them vomit and diarrhoea all over your house. If however, you want a present which may last a little longer than this and you can have as a life-long memory, why not have a personalised piece of pet art? What’s this, i hear you asking ? (or not, if you are a regular reader to this fairly new blog). Okay pet-art can take many forms. One form is dog footprint stepping stones. This is basically stepping stones for your garden, in the shape of dog paw prints. I personally prefer something I think is a bit more UBER-personal, a personalised pet painting!!! Basically here you take a quick cute snap of your pet with your digital camera/ mobile phone/ other amazing gizmo…. then you upload the photo onto the website. Then, artists will HAND PAINT this into a great portrait of your pet. Oh, and for something quite irrelevant, check out these great pet (and people) footprints in the sand. Why not take some photos like this of your dog’s footprints, and then send the photo (well, send, or actually you can upload it also on-line) to Portrait Xpress and then their artists can PAINT this into a amazing painting, in vivid detail. Because its a painting and not just a photo, it doesn’t matter if the original photo was small or blurred, a good painting can still be made. Also, the painting can be made into a ‘Christmassy’ style. So if you want to add mistletoe, reindeer, snow, carol-singers, its all possible! There are many styles of paintings you can do if you are doing paintings. This is pretty obvious I guess. But, if you order a bespoke painting tailor-made to your design, you can chose the style also. One style that artists can do is impressionistic, where its a loose interpretation of the original image or design. For example, George Bush can be painted as follows- this is just slightly impressionistic. Alternatively, things can be painted much MORE losely, or much more of a direct style. See www.portraitxpress.com for details, look at the gallery there, and at the different styles. Note also, that the painting can look different depending on what type of canvas is used. Ask the artist for a very smooth canvas if you want a relective/shiny surface or an image very similar to a photo. Ask for a real canvas with a rough, more open weave texture, if you want a more natural feel to the painting. If you are using a good artist then they should guide you through this process and be very hepful in helping you chose what style to paint your painting, and on what type of canvas. Really you should be able to get a great impressionistic painting (if that’s the style you like) made from your photo. If you like other styles (eg Dali), tell your artist, they should be able to paint it for you in a different way!